This audio power amplifier project is based on LM1875 amplifier module from National Semiconductor. It is able to deliver up to 30W of power using an 8 ohm load and dual 30V DC power supplies. It is designed to operate with minimum external components with current limit and thermal shutdown protection features . Other features include high gain, fast slew rate,wide power supply range, large output voltage swing and high current capability. 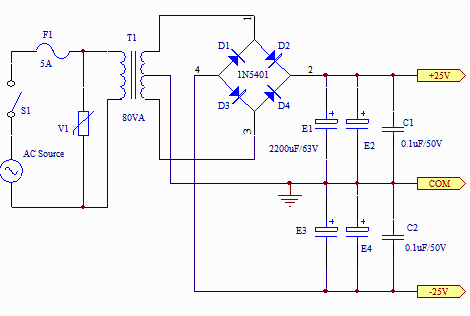 The schematic below shows how the +25V DC and -25V DC are obtained. In order to provide power supply for 2 stereo amplifiers, a power transformer rating of 80VA with 240V/36V centre tapped secondary winding is used. The secondary output of the transformer is rectified by using four 1N5401 diodes together with 4 electrolytic capacitors to smoothen the ripple voltage. A fuse and a varistor are connected at the primary input to protect the circuit against power surge. The +25V and -25V DC power supply are connected to the audio amplifier module through a 2A fuse with the peripheral devices shown in the schematic below. The audio input signal to be amplified is coupled to pin 1 of LM1875 through the resistor R1 and electrolytic capacitor E5. 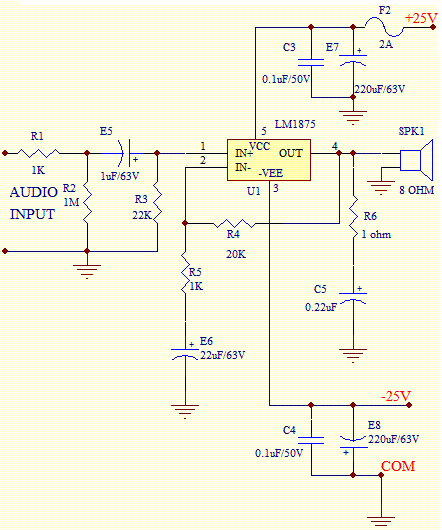 The output signal at pin 4 of LM1875 can be used to directly drive a 8 ohm loudspeaker. Resistor R6 and capacitor C5 prevent the capacitance developed at the long speaker leads from driving the amplifier into Very High Frequency Oscillation. 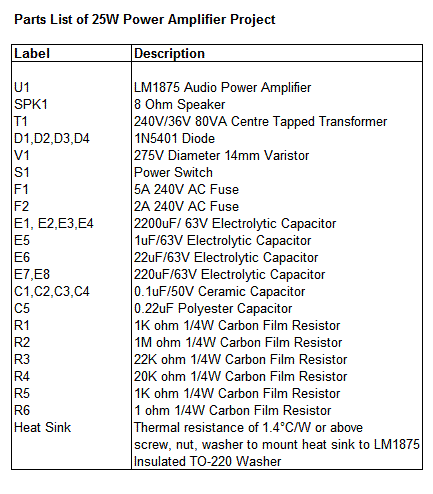 A heat sink with a thermal resistance rating of 1.4 °C/Watt or better must be used or else the amplifier module will be cut-off from operation due to the heat that will build up during the operation of the amplifier. Take note that the heat sink tab on the IC module is internally connected to the -25V power supply hence it must be isolated from the heat sink by the use of an insulating washer. If this is not done, the negative rail will be shorted to ground.